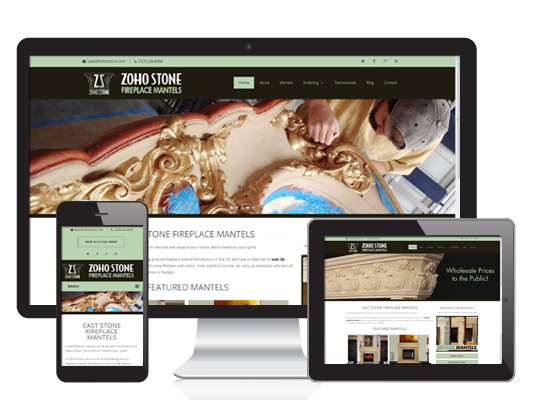 Zoho Stone Fireplace Mantels in Palm Harbor, Florida already had an existing site. The site wasn’t mobile-friendly, and they quickly realized they were missing out on potential customers, especially because Google’s new search algorithm favors mobile-friendly websites in their search rankings. DaBiri Designs created a responsive website that displays perfectly on all smart phones, tablets, laptops and desktops. We created a custom form, using conditional logic, for visitors to submit their info and measurements for a custom quote. Their entire inventory is nicely laid out for visitors to view, with ability to zoom in on photos. All inventory can be sorted by category. The Content Management System (CMS) allows them to easily post their own blogs and news… all at half the cost of what larger design firms would have charged!